Bonnie Bishop has a way of making people stop and listen. Here’s how the great Texas songwriter Robert Earl Keen described the experience: “Her music washed over me with a purity and soulfulness that is rarely found in this world of noise. Afterwards, when I was walking home, I could still hear Bonnie’s songs in my head, and for the first time in a long time, I felt like I was in tune.” One of Bonnie’s songs, “Not Cause I Wanted To,” co-written with Al Anderson, is featured on Bonnie Raitt’s latest Grammy-winning album and is also listed first on New York Times critic Jon Pareles’s Top Ten Songs of 2012. It’s fair to say that Bonnie Bishop has a way with words. “I’m not proud of my mistakes, but thanks to you I’ve got so much to say,” she sings on “The Best Songs Come from Broken Hearts” from her sixth and most recent album, Free. 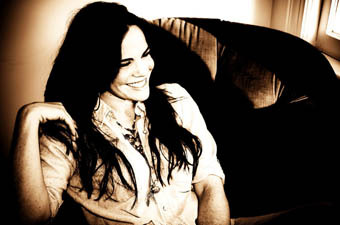 Bonnie grew up in Texas, made the music scene in Austin for a while, and was nominated for Vocal Performance of the Year at the Lone Star Music Awards. She sings in a rich and raspy alto full of soul, at times reminiscent of that other Texan, Janis Joplin, and plays guitar and piano. Currently based in Nashville, she’s made a place for herself in the circle of great local songwriters. The website Blues Rock Review applauds her “superior vocal talent and innovative writing style.” Examiner.com praises her “strongly written blues songs that manage to sound modern while still upholding the tradition of the great blues singers.” She can belt out the blues and break your heart with a tender ballad. Joining her tonight will be guitarist Matt Skinner.